Here’s an update on my blatant rip-off of Jerry’s version of the sock scarf. The yarn I’m using is a Peruvian wool by Cascade. The color doesn’t show very well in the pictures, but it’s a heathered green, with flecks of rust and tiny touches of turquoise. The big pictures shows how far I’ve made it. 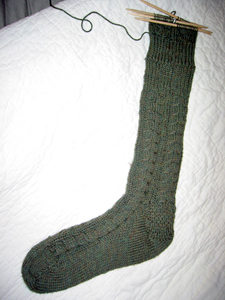 I started at the toe end, and I’ve gone up one foot, around the heel, and up the leg until I ran out of yarn, at which point I started a new skein down the other leg. 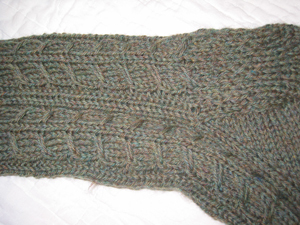 I’ve just completed the ribbing and started on the fish-tail cables. The foot turned out a bit larger than I had really planned, but I kinda like it so I decided to leave as is. It won’t be as long as Jerry’s version. The part that I’ve finished is maybe 2-1/2′, so I expect it will be between 4-1/2 and 5′ when finished. This picture shows a close-up of the fish-tail cables. They’ve been fun to do. I search around a bit to find a not-quite-ordinary pattern that would look reasonably the same “upside down” so that I could work the scarf from toe to toe. I’m working it in fits and starts, it seems. Some days I’ll go a long way, and other days I only get a few (or no) rounds done. But I have hope that I might have it done before spring completely arrives! As always, click on the pics to get the larger version pop-up.